I spent my first three years here waking to school and work and to parties. I made the decision to get a bike and quickly switched back to the ped lifestyle because Omaha is, as we all know, hillier than The Sound of Music and hard to pedal. Sadly, this truth leaves one reasonable choice to get around our beloved metro, which is over 30 miles across: drive the hell out of it. Without a bus, overpriced cab or your dad’s sweet Sebring, you definitely stand a chance to miss a good portion of this city. The double-edged sword with this mode of self-transport is that along the way from Point A to Point B you miss a lot of the details and moments. Capturing stills of these moments is Rob Walters, Omaha photographer, filmmaker and Art Department Chair at Iowa Western Community College. In his new exhibition Driving Omaha at Sweatshop Gallery in Benson, the artist shares a fairly large amount of new photographs detailing a love affair with the road. The gallery will host a closing brunch this Sunday, Oct. 26, from 11 to 3 p.m. Growing up with travel playing an integral part of his youth, Walters has continued to build recurring and extended drives throughout Omaha and the surrounding region into his practice. It is during such excursions that he stops to document utterly unremarkable yet serene locales in the city. Though these images are taken outside of the confines of a vehicle, they carry an energy of a quickly captured moment from the driver’s seat but not through the windshield; the artists has gifted the viewer with the experience of stopping for a single moment and looking left or right. The result is a series of images nearly devoid of figurative subjects that in many ways recall the post Hurricane Katrina Gulf Coast: bleak and without an inch of activity, even when figures are present. Images like “I-80 Interchange, Omaha NE” and “Seward and NW Radial HWY, Omaha NE” present places in and around Omaha that are nearly unrecognizable. They are cold and unwelcoming with most of the photos shot in either late fall or early spring when the Midwest and especially its cities look their worst. Others, as in “Mid America and 24th St., Council Bluffs IA” and “20th and Farnam St. Omaha NE” show what would be a bustling intersection or gas stations that again, aside from some parked cars and working street lights, could be pulled from documentation of a disaster. Like many powerful works, the deafening inactivity is where these photos gain their strength. There are a few that work this angle a little too far though. Take into account “23rd and 18th St. Council Bluffs IA,” a photo taken in the country of a small farmhouse dwarfed by a large tree. The photographer placed himself at an intersection where one of the two useable paths in view is marked as a “dead end”. But it doesn’t end there. The road is blocked by a passing train, creating a sort of double blockade to its journey. The photo comes off as too easy and a little amateurish though the simple humor in it helps make up some ground. 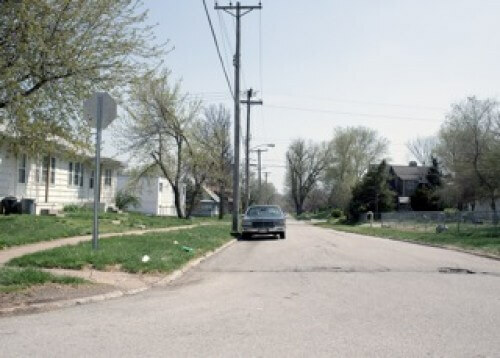 Another photo that comes off as a little troublesome is “30th and Ames Ave. Omaha NE.” The issue with this work is that it departs from the pack by showing actual activity. Every other work in the exhibition is still and quiet, yet this one features vehicles crossing an intersection and it simply breaks away from the pack a little too much. It would be easy to dismiss the entire exhibition as just a group of photos removing any ounce of gloss from our mental image of Omaha, Nebraska. On a very superficial level that is exactly what it is. But there’s more: nearly every single photo contains a similar composition: the horizon line in each piece cuts straight through the middle of the photo and most include a lone high point in the image, a light pole, a high rise, trees left bare and uglied by Autumn reaching upward creating a centered visual pyramid in each work. Even though the photos can be tied to the group by palette and subject matter, the artist has also used the composition to create a beat that builds and retreats through the length of the show. At the opening reception, Walters referred to the work in its entirety as a “rock album”. Though it is not clear if the repeated composition – acting as some sort of varied but easily recognizable style – is what he was referring to, it seems to make sense. These twenty-six photos, regardless, are why photography-based exhibitions can still be something to experience. Viewers would be surprised to find that, after taking in these works over the course of a gallery visit, they are looking at locations in their own neighborhood, intersections they cross daily. Most of us here drive, but whether you’re in a Passat, a fixie, a hooptie or on foot, I would highly suggest a visit to the sites the artist decided to feature or simply stopping for a second upon your normal route and looking anywhere but the road ahead. Driving Omaha closes this Sunday at Sweatshop Gallery in Benson with a brunch from 11-3 p.m. For details go to sweatshopgallery.com.